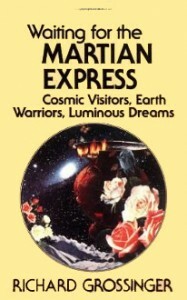 Reading through Richard Grossinger’s book Waiting for the Martian Express: Cosmic Visitiors, Earth Warriors, Luminous Dreams, and struck by a number of things. “Harmonic convergences are counterproductive to the degree that they distract people from the real issues. They are like Fourth of July celebrations and rock concerts – on the calendar mainly to promote ideology and commerce.” (p. 13). “In our imaginary (cumulative) New Age holy book, life (and the universe) are a Gothic tale with plots and subplots (including angels, extraterrestrials, Atlanteans, intelligent sea mammals, Yetis, Indian guides, spirits taking turns taking over bodies and speaking oracularly, magical temples, messages left in pyramids, multidimensional travel, past-life evolution, the Second Coming, and the like). The New Age is not yet a commitment to the unknown nature of reality, or our own novel experience; it is a screenplay for events that have supposedly been programmed and foreshadowed, narrated to us by those who have already lived. This kind of on-high prophecy seems pretentious and elitist in the face of our actual condition.” (pp. 12-13). “In addition, the various rescues by aliens, earthquakes, and economic collapses that have partial New Age allegiance (depending upon one’s affiliations) are denials of the complexity and commitment of life. It is not that they couldn’t happen; it is that they are not real. The biological process that underlies this world is profound and serious and represents a covenant with the divine force; it cannot be abrogated from other dimensions. If there is a macrocosm and a microcosm, these are not separated by great walls or even master geometries; they are joined a billion times more intimately than the minute branching and impregnation of nerves and flesh.” (p. 15). “If someone is dead, is he or she necessarily wiser?…The implication that the glimpse beyond death is so enlightening it lone transcends any earthly enlightenment tends to trivialize both this life and the fact of dying…” (p. 16). Grossinger, Richard. (1989) Waiting for the Martian Express: Cosmic Visitiors, Earth Warriors, Luminous Dreams. Berkeley: North Atlantic Books.